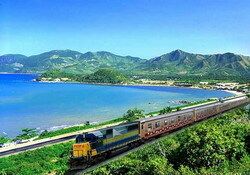 Please contact us to reserve your room in Saigon - Nha Trang train. At present NO Golden Train available. 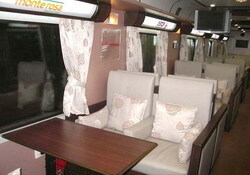 We can book tourist-standard train with 4-berth or 6-berth cabins only. The 5-Star Golden Trains features 12 carriages in different categories with specific decoration and design to make you experience the most comfortable and enjoyable trip. 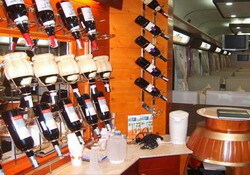 - Air conditioner, bar and dedicated luggage area at each carriage. 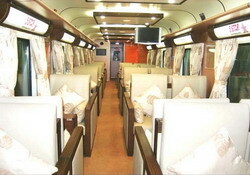 - Each carriage has 32 sofa. 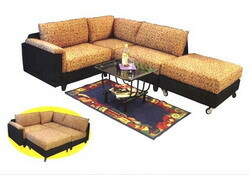 Dinning-table, power port (2 hole-plug and 220 Voltage), luggage shelter at each seat. 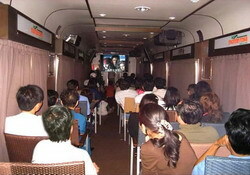 - 4 LCD TV at each carriage. Modern rest room and hand-wash area. 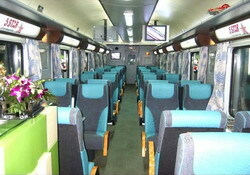 - Each carriage has 44 adjustable seats. Dinning-table, power port (2 hole-plug and 220 Voltage), luggage shelter at each seat. - Modern rest room and hand-wash area. 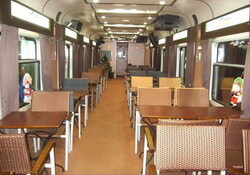 Restaurant carriage: 6 dining tables, 4 persons per table. 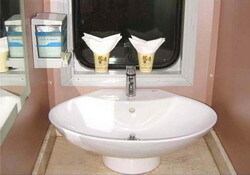 - Mineral water and towel for each passenger. - Daily Newspaper, Tourism Magazines - Travel live in Vietnamese and English version. - Wide range selling network with sale agents and ticketing offices, 24/7. Professional staff and modern ticketing system.